The Gefen HDTV Splitter Distribution Amplifier (EXT-HDTV-142) allows set-top boxes, DVD players, D-VHS players and other HDTV devices with a DVI output to be connected to two or more HDTV displays at the same time. 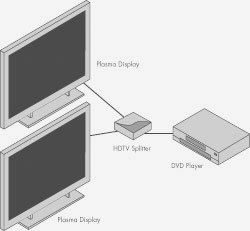 It is a flexible distribution hub that cam accommodate multiple displays when two or more HDTV Splitters are connected together to create a greater distribution. The HDTV Splitter is connected with a DVI cable from the DVI source to the HDTV Splitter input. There are two DVI outputs. DVI output 1 is the primary connection and is used for the main display. DVI output 2 follows the main display. Only output #1 of the HDTV Splitter is HDCP pass-through.